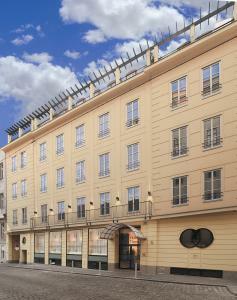 K+K Hotel Maria Theresia: Ambiance and style in the city centre of Vienna!You’ll find this urban, friendly hotel in the artists’ quarter on the Spittelberg – tucked away in a peaceful corner at the very heart of Vienna. The combination of exclusive atmosphere with individual service and Austrian hospitality makes for a truly special experience: the exquisite decor and cheerful, contemporary feel makes your stay even more enjoyable. Whatever your tastes – romantic imperial or artistic trendy – you’ll find the Hofburg, the great museums in the new Museums Quarter, the shopping along the Mariahilferstraße boulevard with its attractive restaurants, galleries and boutiques, all just a short walk away from the hotel. K+K Hotel Maria Theresia. Your state-of-the art conference venue in Vienna!With its ideal location, attractive interior design and state-of-the-art amenities, the K+K Hotel Maria Theresia is suitable for all sorts of meetings and conferences. We personally look after you and offer tailor made packages.K+K Hotel Maria Theresia:. Quiet inner city location in the Spittelberg quarter, renowned for art and culture. . Easily accessible by public transport (underground lines 2 + 3) or car (hotel has its own car parking facilities). . Conference area with its own foyer and Business Lounge (with PC, Internet/e-mail, printer, international newspapers and magazines). . All conference rooms have plenty of natural light (large window frontage) . Fully air-conditioned conference area, with individual temperature control. . State-of-the-art conference equipment: LCD projector, TV/video recorder, DVD/ CD player, overhead projector, slide projector, screens, flipcharts, pinboards, magnetic boards, podium, lectern, presenter’s case, direct phone connection (ISDN and analog). . Free high-speed Internet access (via LAN/wireless) in all conference rooms. . Wide range of food and drink. . Concierge service (restaurant reservations, theatre/opera tickets, etc). . Secretarial service (translations, fax, photocopying, etc) on request.